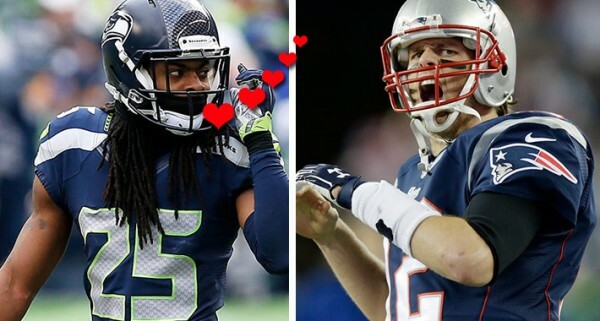 It’s always easy to find common threads between two rivals in a Super Bowl clash. When it comes to the New England Patriots and the Seattle Seahawks, it’s not all about compliments. These teams being two of the most hated franchises in the league is another thing that links them together. Arrogance is one thing that comes to mind. The Seahawks have complained about that when it comes to the Patriots, at least in the past. But the Seahawks have Richard Sherman to cover that aspect. Russell Wilson, despite being a less flashy and exposed quarterback than Tom Brady, get plenty of hate himself. Why? The same as the ongoing hate for LeBron James – not everyone actually remembers when they started hating on someone so badly. There is a difference of where the hate for each team stems from. Obviously, the common thread is success. The Seahawks have been good and letting everyone know about it only for the last three or four seasons. For the Patriots it’s been going on for 15 years, or the entire Belichick – Tom Brady era. But that is where the similarities end. A lot of the hate for the Patriots comes from their perceived arrogance and what feels like an establishment supported team. The Seahawks have earned a lot of the hate because of their fan base. Bandwagon fans is a term heard quite a lot when it comes to the Seahawks. In most meme threats making fun of the Seahawks their fans are the most popular subject along with Richard Sherman and that famous rant after the 49ers game. This is a franchise that had very few stretches of consecutive success. It’s no wonder that now, when they’ve finally won a Super Bowl and might be the best team in the NFL for a second straight year, it feels like Seahawks fans are coming out from every pot hole. In the 1997 film ‘Private Parts’ which depicts the career of Howard Stern there’s a famous bit when two radio executives that are trying to get rid of Stern from their station go over the ratings. It turns out, the people who hate Howard Stern listen to him more than his own fans. That’s true in almost everything, including sports. And having two teams a lot of people love to see fail and celebrate their misery makes this Super Bowl even bigger and more interesting. The Seahawks aren’t a pillar of this league. The Patriots only became one at some point. They aren’t the Dallas Cowboys, Pittsburgh Steelers, New York Giants and Green Bay Packers. Maybe they never will. The Cowboys can go on not winning Super Bowls into the next millennium and they’ll carry on being the most talked about team in the league. Some habits are hard to change. But the Patriots are a long running theme of success and all the bad things that come with it, including that annoying word, dynasty. Although everyone wants to be loved in a way, the Seahawks wouldn’t mind finding themselves in the same place the Patriots are in a few years.